Alternate Title: Interior N.Y. subway, 14th St. to 42nd St. This is a surprisingly artful “actuality” film, showing the New York City subway for people all over the country who had only heard or read about it. This is a great example of how the cinema brought people from all over the country (and world) together, and established iconic images that everyone would recognize, even if they had never seen the original. 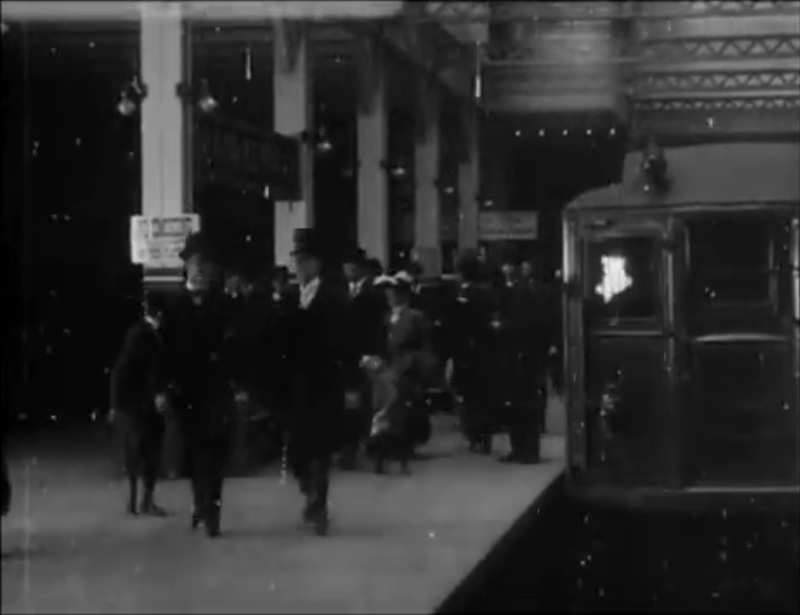 This film consists of a single long shot taken from the front of a train following another train. The train we follow is in actual service – it stops at stations and lets people on and off, but “our” train (which we never see) simply keeps pace with it. 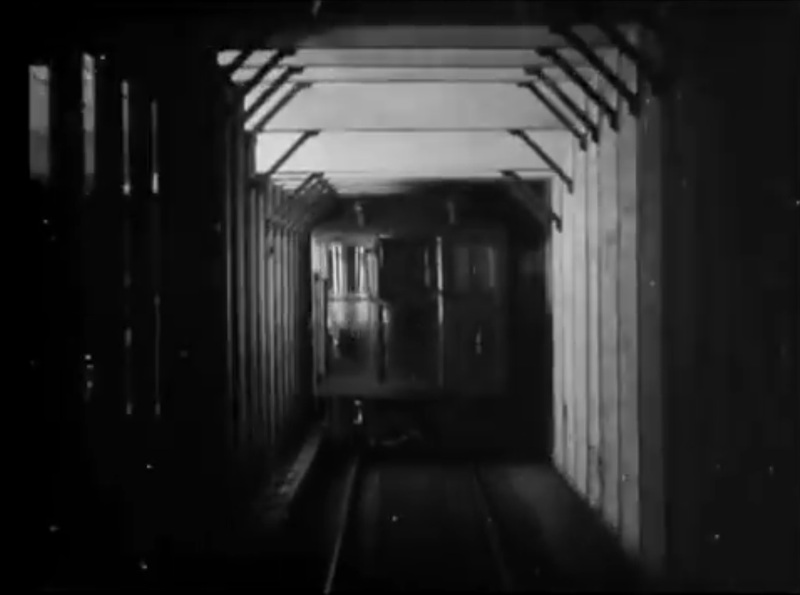 Another train runs on the side track, with a platform full of lighting equipment, which makes it possible to see the train in front (and the tunnels), but it also sometimes comes into view of the camera. The train runs, according to the notes of cameraman Billy Bitzer, from 14th Street to 42nd, and we can see signs that say “Grand Central” when it pulls into the final station, which suggests that we are following the course of the modern-day 6 train, which I believe was part of the Interborough Rapid Transit (IRT) line at the time. This train must be an express, because it doesn’t stop at all of the stations we pass through. Much of this film shows us racing along in a dark tunnel, with just the back of the train ahead of us visible. We only get a square of light, with the girders of the tunnel appearing and disappearing as the light passes over them, and then an occasional station, which we don’t see very well, because we are looking ahead, not to the sides. It’s a lot like what you see when you stare out the front of a subway train, which I have always found somewhat hypnotic. I should mention that I grew up in New York City, and I regularly rode the Subway for family outings (eg: to the Bronx Zoo) and later every day to get to High School. Today, many of my worst nightmares, or more precisely, anxiety dreams, are set in the subway system: usually the theme is that I have a destination, but I miss my stop, or go to the wrong tracks and can’t find a way to the right ones, or am otherwise prevented from getting to my destination. I have this dream most frequently when I am stressed out about a task which seems endless or impossible, or when I am feeling frustrated and hopeless. The images of this movie invoked that dream-landscape for me, but happily without the accompanying stress. I was able to accept that I was just along for the ride, and enjoyed it, knowing it would end soon enough.